In many modern buildings hard materials are used such as concrete, metal, glass, etc. The reflection of sound waves through these materials is often considered to be unpleasant. An excess of noise has a negative impact on our mental health: fatigue, irritation, stress, etc. For an office environment this results in a drop in productivity, for catering businesses less satisfied customers and less return. In practice, sound absorption often still happens via acoustic walls, but then you lose the initial look and feel of the building. In order not to affect the architecture of the building, you can use the Rosa. The Rosa combines lighting with sound absorption. The shape of the Rosa can be compared to a petal and is available with a spot or without. The Rosa can also be perfectly combined with the Planet Air 700 , which then forms the heart of the Rosa Rosa as it were. What exactly is sound absorption? Sound consists of vibrations that propagate in the air. When a sound wave comes into contact with a material, the movement of the air particles is converted into heat (kinetic energy). Material that bends, for example, absorbs the vibrations. The sound disappears in the material, as it were. Materials that cannot convert sound energy into heat reflect sound and cause reverberation in the room. Sound absorption determines the amount of sound that is absorbed within one room. If your room consists of hard materials, you can use sound-absorbing materials to shorten the reverberation time within the room, improve speech clarity and avoid background noises. The sound absorption coefficient of a material reflects the capacity of the material to absorb the energy of a sound wave. This varies from zero to one. The higher the number, the more sound the material absorbs (or lets through). An open window has an absorption coefficient of 1, which means that all sounds are let through. Acoustic materials absorb sound. A material with a zero coefficient completely reflects the sound. Glass and steel have a value of less than 0.05. Be careful! Sound absorption is not the same as sound insulation. With sound absorption, it concerns one room, with sound insulation it concerns noise nuisance from one room to another. Depending on the purpose of the room, a reverberation time of 0.5 to 0.8 seconds is recommended in offices. Glass and concrete produce a reverberation time of 1 second. In rooms with a lot of glass or concrete, you can therefore add absorbent materials. To achieve these standards, the Rosa is made of Basotect, a foam made of melamine resin. This foam has the property that it traps sound waves. Reverberation decreases and speech intelligibility improves over a short distance. Basotect has an absorption coefficient of 0.9. Sound is therefore almost completely absorbed. "With the Rosa as eye-catcher you give a twist to a smooth architectural story." • in light colours 927 or 930. Light colour 930 is recommended for office areas. • With or without a dimming option (Dali, 1-10V, TE-LE). Download the product leaflet of the Rosa 700. More productivity in the workplace: off course you want it too! Productivity is influenced by different factors and you can find dozens of tips online to improve it. But one factor is often forgotten: the lighting! A lot of times in office design insufficient attention is paid to lighting. Maybe you also think "if there's light it's ok" but nothing could be further from the truth. Bad lighting causes tired eyes, headaches, loss of attention, a negative impact on well-being and motivation, … Good lighting on the other hand has a significant impact on productivity and the well-being of employees. And what's also good to know, it can reduce the energy bill. Ambient light has a great influence on the biological rhythm of sleeping and being active. Maybe you know it too: you have more energy on the brighter days. A human's activity level and health benefit from light. Daylight is and stays the best kind of light, but not every office can profit of a lot of daylight. Most of the time we need artificial lighting. When choosing lighting fixtures, take into account the daylight that comes in and adapt the artificial light. Choose strategic points to place your lighting. Daylight control can offer a solution for cloudy days. The light adapts automatically to the incoming sunlight. Keep in mind that not only the work spaces but also the surrounded spaces deserve your attention concerning lighting. Task lighting is used for surfaces on with the eyes are focussed on when doing tasks. E.g. 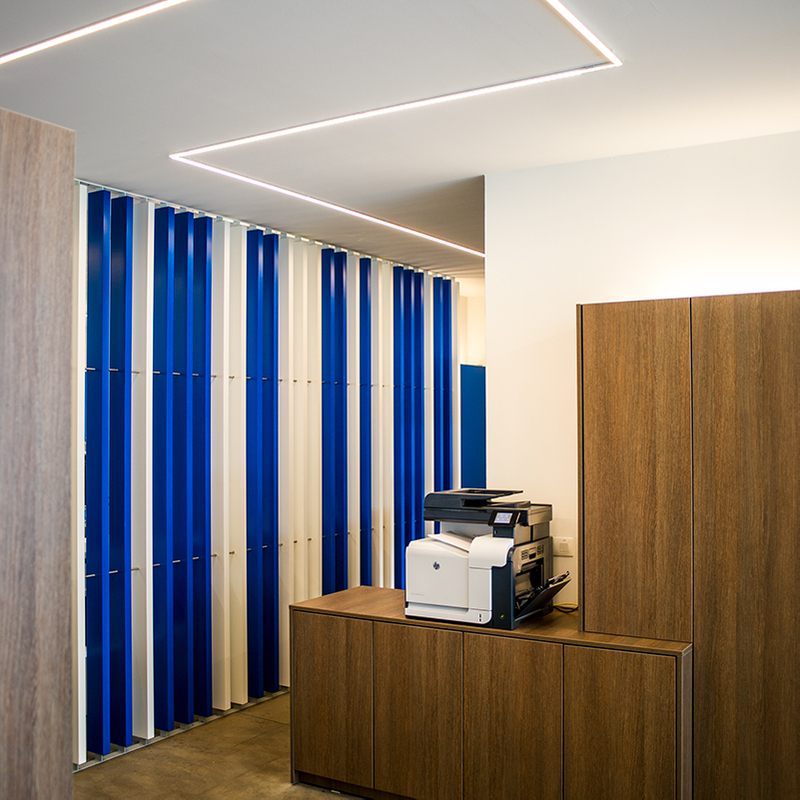 desks, meeting rooms, presentation screens, … For the different task areas and adjacent areas, standard have to be followed for the required light intensity. For other spaces there aren't immediately standards available. But think about it anyway. It has advantages for the visual communication between people, visual presentations in the spaces, the look and feel of your building, and the ambiance in the office. We talk about glare when a bright surface is experienced as disturbing. There are two types of glare: direct and indirect glare. Direct glare is caused by a light source that shines directly in your eyes eg. artificial light or the sunlight. Indirect glare is caused by the reflection on a smooth surface eg. a computer screens. For both types of glare, you have standards that have be followed for task areas. These are expressed in terms of UGR (unified glare rating). The higher the UGR, the higher the chance for glare. For offices the maximum UGR is 19. Give also some attention to the light distribution when you choose new lighting for your office. An equal distribution of the light gives a nicer work atmosphere and it's better for your concentration. For light lines in offices, a lot of time prismatic plexi-glasses are used. These plexi glasses distribute the light more equal than a standard plexi glass and bow the light which prevents glare. For light colours there are no specific standards for offices. The choice of the colour depends most of the time of personal preference and the chosen interior. For offices, it's recommended to go for a colour temperature of 3000K or 4000K. Warmer light isn't desirable. Warm light is comfortable but not beneficial for the productivity. For the colour rendering it's advised to have a minimum of 80. Do you want to learn about office lighting? Do you want to experience the difference between the light colours 3000K and 4000K? You can! Stop by in our experience showroom!In a simulated office environment we demonstrate the different possibilities. Mail to showroom@lunoo.eu for an appointment in our showroom or at your office. Why should you choose for track lighting? Do you need a flexible lighting system? Track lighting offers you the best solution. At stores, track lighting is already well represented but also for other applications track lighting can offer advantages. Think e.g. at musea where multiple exhibitions take place every year? Flexibility is the main advantage of track lighting. Only the track is fixed, with the lights you can play. With a simple click system general lighting and accent lighting is installed onto the track. Does your interior change? No problem. Move without any effort the fixtures to their new place. The Varo and Varo Flow are two new spot lights within the Lunoo range. The Varo Flow has a luminous flux of 1500 lm to 4500 lm and the Varo from 1000 lm to 3500 lm. The light colours are for both fixtures 927, 930, 940, crisp white, meat or gold. You can use the projectors for general or accent lighting by choosing the right reflector.